Gross vs Net Income: What’s the Difference? Home » Financial Ratio Analysis » Gross vs Net Income: What’s the Difference? Gross and net income are often confused by many people because they tend to have different meanings when talking about pay, wages, or business in general. It’s understandable that many people mix these two terms up because they are kind of confusing. The words’ meanings change depending on the context. For example, businesses use these terms to describe financial ratios while employees use them to describe differences in salaries. I’ll explain both of these terms in detail, so you can understand what each mean. We’ll also look at formulas and walk through a couple of examples to illustrate each. So, what is the difference between gross versus net income? First, we need to define each as they relate to a business and an employee. Businesses use the terms gross income and gross profit interchangeably. This means that according to businesses, gross income is to the amount of revenues that exceed the cost of goods sold. In other words, this is the amount of income left over after all the costs of making the products have been accounted for. This does not take into account any selling and administrative expenses or taxes. Businesses use this to compute the amount of earnings that can be used to pay these operating costs. This business would report $50,000 of gross annual income ($100,000 – $50,000) on the income statement right after the cost of goods sold section. Notice the selling expenses, admin expenses, and taxes are not taken into account. This is simply one step in the net income calculation. Employees have a completely different definition. Employees or wage earners use the terms gross income and gross pay interchangeably. Gross income, to an employee, is the total wage or salary that an employer pays the employee before taxes and other deductions are taken out of their paycheck. Keep in mind; this is not the gross amount that the employee actually gets to take home. This is the actual expense to the employer. For example, an employee who makes $30,000 per year might have $9,000 withheld from their paychecks to pay income taxes, FICA taxes, and his or her share of employee benefits. The difference between gross pay vs net pay is $9,000. Gross earnings equals the full amount that the employers pay—not the amount the employee receives. To a business, net income or net profit is the amount of revenues that exceed the total costs of producing those revenues. In other words, the formula equals total revenues minus total expenses. This measures the amount of profits that remain in the business after all expenses have been paid for the period. These profits can either be retained by the company in the retained earnings account or they can be distributed to shareholders or owners. Looking at the previous company example, we would compute a net income of $20,000 by subtracting all the expenses from the company sales ($100,000 – $50,000 – $10,000 – $15,000 – $5,000). This business would report the $20,000 of net income at the bottom of the income statement after all of the expenses. Employees, on the other hand, consider their net income or net pay to be their total pay less all deductions like taxes, insurance, and employee share of benefits. This is often called take home pay because this is the amount of money they receive in their paychecks each pay period. Going back to our example, this employee would compute his annual net pay of $21,000. 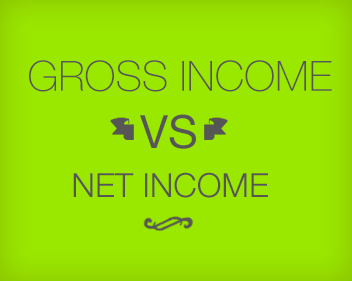 Now that we know the definitions of net vs gross income, we can compare the two. Let’s look at both and differentiate between the business usage and the individual usage. Businesses use the gross earnings to indicate the amount of revenues left over at the end of a period that can be used to cover the operating expenses. It’s a little confusing because usually when you hear the word gross, you think total. You can remember it this way. It’s the gross amount of income after all cost of goods sold are paid. This is reported near the top of the income statement and is an intermediate step in computing the net profit for the year. Businesses calculate their net income at the end of the year by subtracting all operating expenses from the gross profit. This is called the net income because it equals total revenues minus total expenses. It’s the net of everything. As I mentioned before, this is reported at the bottom of the income statement and is commonly referred to as the bottom line. The employee or wage earner looks at these terms much simpler. Net vs gross pay is simply the difference between what is taken out of the employee’s paycheck. Gross is the full amount paid by the employer while net is the amount that the employee receives in his or her paycheck (the full amount less any and all deductions). 1 What is Gross Income? 2 What is Net Income? 3 What is the difference between Gross and Net Income?